OH the first sign is a lil' disturbing or thought provoking.. But you are right that all antiques at some point belonged to someone that had passed on.. hmmm.. Like the chairs too!! I'm still chuckling at your post title , isn't that wonderful ! I hope your headache is better . ..You know there are some people who cannot be around antiques. They are too sensitive to the lives those items have seen. I know... I hate it when they call it dead people's stuff! Actually, when someone like you takes it home it's a beautiful thing because you now get to love and cherish it for a while. We leave, our stuff stays. I hope they are waiting for you next week... your name is all over them!!! An interesting way to advertise!! I suppose it catches your eye, but doesnt show much respect for the 'dead'! Still, Id definitely stop and look, and if I lived closer, I would have fought you for those chairs! Hi Simone ~ I ventured over from Le Monde De Catherine~ and it is beautiful here. I often wonder the same thing about who used/owned something before me. Love the pink and green on those white kitchen chairs. Hope they are still there for you next week! That sign is so funny. Funny but true. I don't mind that the things I buy 'were' someones at some time though. I know it has a history and story behind it. I think that is why I like vintage things to begin with. Besides the look of the item it has a rich history. I hope when you go back the chairs are still there. Someone wonderful may have sat on them:)Let us know. Oh wow! 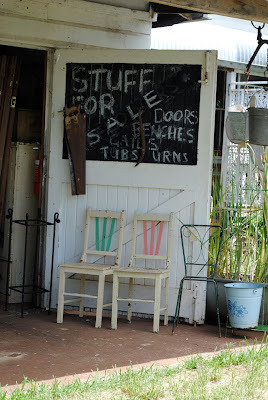 I wish I could go there and browse...I love the galvanized buckets out front! What a cute place......I love buying thrify finds, they always make me wonder of the history behind them. Good luck on the chairs Simone! I think not knowing who the items belong to is all part of the mystique of purchasing second hand. The kitchen chairs are beutiful. And the little antique's house is real nice to see. What a look! Finally, did you buy something? I know someone whose business is buying dead people's stuff and then reselling it. he's making good money too! I dont think I could write a sign like that out the front of a shop..bit spooky for me!! BUT you are "dead" right in your thoughts..lol..
looks like an awesome little shop..& I am guessing goodies were at a good price? that is a really weird thing to think about. but youve gotta love antiques, no matter who theyve belonged too. how beautifull simone! !yes you have to return and get that lovely chairs!!!besos!!! That sign says it all! It is definitely thought provoking! Thought of you today as I was browsing in a "coastal" store. There was a lovely mermaid made of seashells. She reminded me of your branch with shells hanging... Maybe I will recreate it and post it one of these days...when I finish all my canvases. What an interesting thing to think when shopping vintage! A little sweet and a little spooky. This is one of my favourite antique shops. I love Heath's world down the road at Bangalow too! Okay that sign is hilarious!!!! Yes that does make you think doesn't it!! All I have to say..is I would absolutely ADORE being able to shop a bit in that little shop!!!! OMG!! I'm with you on those little white chairs...that's the first thing I spotted. That little shop is a goldmine! Oh do enjoy when you pop back! Pop over on Wednesday...my post will give you an idea of the beaches here on Bainbridge Island! I expect that most of my stuff belonged once to a now dead person . I don't mind - I always think if their stuff makes me happy then they must have been happy too - it's comforting ! ooh I could see myself operating an odd little shop like that with dead peoples stuff in it! 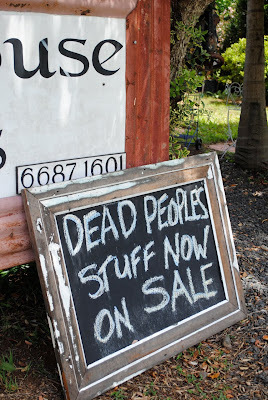 "Dead people's stuff on sale"?! Oh my!!! Well it certainly makes you stop and think! Such sweet chairs, hope they are still there. "Antiques made daily"? Probably made by dead people, hahaha !! Greetings from Tybee Island, Georgia USA! I LOVE your blog and love the fact that someone half way around the world has the same passion I do! Visit my website and blog and you'll see how our cottages are all furnished beachy thrifty chic! www.mermaidcottages.com Come visit some time! I find it pretty funny too....and at the same time it's so interesting, as you say, to think about the stories behind all of these unique vintage items! You are so right! I have so many antique things in my house - I especially love anything from the late 1800's/early 1900's. It is fun to think about the people who used them before you! I hope those chairs are still there - I love them! Sounds creepy doesn't it...but the truth is I think of the romantic side of the vintage pieces I own. Wow, never thought of my vintage treasures in that light, but how true it is. And to think our possessions will probably be in a little vintage shop one day, ready for someone else to love. And what a divine little antique shop. I wish it was a little closer to home. Ooh - I don't know if I like that sign. I like the fact that my teasures used to belong to someone else. It makes me feel like I'm giving something new life and honoring the person who had it before when I'm enjoying it. My engagement ring is vintage and it has a date engraved on the inside. I wish I knew about the woman who got married that day. So intruiging! Oh yes, the white chairs are lovely, And as far as dead peoples stuff,I think they would appreciate, someone adopting their old stuff. Hello! I am new to blogging and a friend suggested I visit your site as we have been to similar places, and love, the coast! I live in Byron Bay and I am really loving your blog. 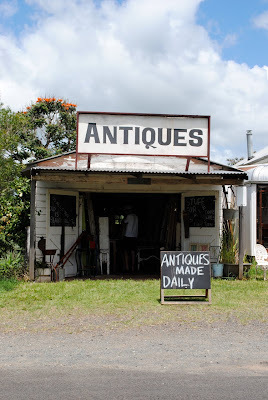 I was so excited to see that you have been to Country Antiques - what a gem! I will be visiting again!